Great Move Eastern Connection Movers. You were on time, had professional service, keep up the good work! Thanks again! Thank you Eastern Connection Movers for moving our company employees. Your services are certainly superior to other movers we have used. We look forward to using you again for future employee moves. Eastern Connection movers service was excellent in moving me and my wife and our possessions from the Warwick hotel here in Philadelphia to our new home in South Florida. 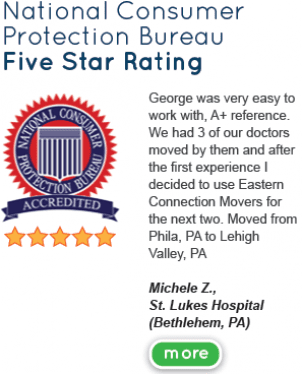 Roosevelt Cross one of the nation’s biggest municipal bond companies wants to thank Eastern Connection Movers Company out of Sellersville, Pennsylvania for their most careful and utmost professional moving services. I would certainly use their service again and highly recommend them to others. Thank you Eastern Connection Movers! P. Falco Director New York City offices. My experience with using Eastern Connection movers to move my home furnishings locally was super! Needed to move from my Inner city life to a home in Upper NJ. I called Eastern Connections because they were the cheapest movers I could find. I called and was astonished by the customer service. They were prompt, and handled everything with care. Highly recommend!